At Tuesday April 2nd 2019 Maryam Asoodar and Jan Hensgens (both taskgroup Instructional Design and eLearning) in cooperation with Ilse Sistermans (University Library) did run a highly interactive lecture about the use of videos and knowledge clips for the Faculty FHML. This lecture was attended by about 40 staff members. The main focus was at a didactive perspective, emphasising the necessity of an educational embedding of a video. The alignment of learning goals, the design of the education, the learning material and the clip has been discussed. Some guidelines about multi media design and some quality criteria to grade existing knowledge clips has been provided. The audience has been involved actively using the online tool Whooclap to discuss the Why, What, How of knowledge clips. Finally an overview of the production steps are provided. The presentation and the results of the interaction can be downloaded here (presentation as ppt-file). Het houden van groepspractica, maar dan net iets anders. Tegelijkertijd kent de inzet van deze software een keerzijde: “De practica wordt je geacht in eigen tempo te volgen en als je klaar bent, kun je naar huis gaan. Met deze groepsgerichte aanpak moet echter iedereen blijven zitten.” Een ander nadeel is dat het centraal de aandacht grijpen het eigen werkproces van de individuele student stoort. “Dit moet dus op een afgewogen wijze ingezet worden.” Tenslotte “mijn belangrijkste les is dat bij het introduceren van zo’n systeem de opzet van de practica nog eens goed doorgelicht zouden moeten worden.” Tot zover de eerste indrukken van enkele docenten. Indien je zelf overweegt om practica op een andere wijze in te richten of als je ondersteuning nodig hebt in het doorvoeren van aanpassingen, kun je de hulp inroepen van de taakgroep via id_elearning@maastrichtuniversity.nl. Interactive Word Cloud to activate pre-knowledge. In my previous job as a lecturer at Hogeschool Zuyd I have run several workgroups on Qualitative Research for learning groups in their first year ICT. This course (in block 4) was more or less a continuation of a previous one about Applied Research (in block 2). To bridge both courses and to mobilise their pre-knowledge I used the technique of word clouding. 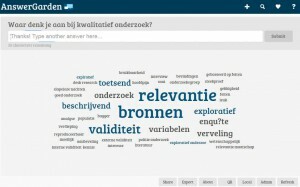 On the basis of an easy question and using an online brainstorm the learners created a collective Word Cloud. My simple question was: “Write down the most important concepts, which popup in your mind concerning qualitative research”. After the input stopped, the final result was shown using a beamer.